Almost everyone who owns a dog is responsible and considerate to others and cleans up after their pet. Unfortunately we know that not all dog owners think about the impact that not cleaning up after them has on other people. It has been noted that there has been a lot of dog mess appearing outside of the school and in the roads nearby. 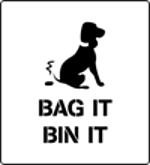 If you see any incidents of dog fouling it can be reported to East Devon by contacting the Environmental Health team using the Report It facility on their website, by calling on 01395 517456 or by emailing environmentalhealth@eastdevon.gov.uk . If an incident is reported then full details of the situation, the dog and its owner, dates and times must be included. If the dog owner is not known the response may be limited but it is still worth reporting concerns because the council may be able to help.